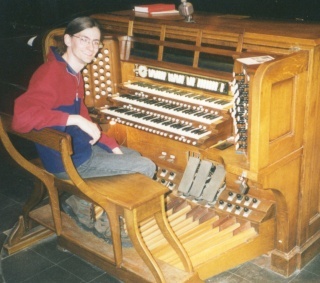 pipe-organs.net is written and designed by Alastair Disley. Alastair is currently completing his PhD in the Department of Electronics at the University of York, England. His topic is "Timbral Semantics and the Pipe Organ", and some papers written during the course of this study can be found on his personal web page along with information on his other interests. Alastair plays piano and pipe organ, and is Web Editor of The Organ. pipe-organs.net has been under development since 1996, and future plans for the site include more virtual organs to play, spanning several historical styles, and an encyclopedia of the pipe organ. If you have any comments, corrections or ideas, please do email Alastair. In order to avoid unwanted junk emails, you must use a little intelligence to deduce his email address. Replace "surname" in the email address "alsurname@care4free.net" with his real surname. All content is copyright, and may not be reproduced without permission, but if you wish to reproduce anything, do please ask. For a more detailed look at copyright and how it affects this site, please read this Copyright Information. All content on pipe-organs.net is © Alastair Disley unless otherwise specified, and may not be reproduced in any form without prior permission.